By Eric Daniel Fournier, M.A., M.E.Sc., Ph.D. 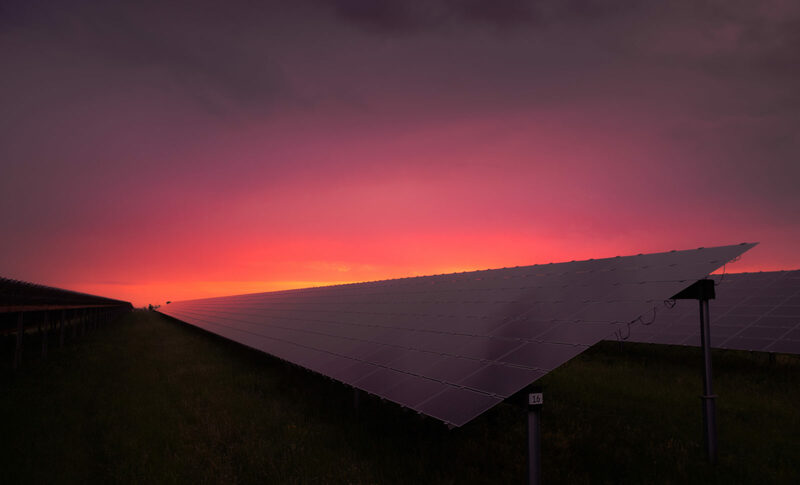 In June of this year, the global news media reverberated with reports of a record shattering low bid for the world’s cheapest commercial solar installation. The bid was the best of five submitted by a group of international consortiums to a state owned electric utility in the United Arab Emirates. Coming in at a projected 2.99¢ / kWh for an 800 MW installation, the price performance of this proposed solar generator project undercuts that of even the most advanced coal-fired power plants. While questions remain about the long term profitability of this bid, as well as the role that anomalously low cost of financing may have played in its development, its mere existence suggests that the once distant notion of cost competitive renewable energy is a much closer prospect than many had previously anticipated. It is undeniably good news that the cost of solar modules – as well as fully installed photo voltaic (PV) systems – is declining at this incredible rate; however, for those of us (including the team here at the California Center for Sustainable Communities) who spend our days fighting in the trenches against the many hard realities of integrating distributed renewables into our aging electricity grid, this news of cheap solar is also a potential source of concern as it often overlooks some major necessary transformations. The key challenge associated with integrating solar, even cheap solar, into our existing electric power grid is that panels only generate power during the day, when the sun shines. While we consume a significant quantity of electricity during the day, we also need it at night. In order to buffer this difference between the time frame over which solar is capable of supplying electricity and the time frame over which consumers demand it, a mechanism, or mechanisms, for energy storage are needed. The failure to take the cost of this necessary storage component into account when evaluating solar against traditional energy supply technologies is a serious oversight; a bit like giving away bicycles without wheels. Solar panels alone fall short of the complete system needed. The result of this oversight is the systematic underestimation of the true cost of implementing a solar based energy system capable of delivering a specified quantity of electricity at any time, day or night. To illustrate this problem more concretely, let’s take a look at the actual hourly breakdown of the electricity generated by different renewable sources within the California ISO (CalISO) balancing region for 6/10/2016 plotted in upper right hand corner of Figure 1. Over the course of this single day, the quantity of electricity generated by the available solar PV installations within the CalISO region fluctuates from zero during the nighttime hours to nearly 8,000 Megawatts around mid-day (Ref: http://www.caiso.com/market/Pages/ReportsBulletins/DailyRenewablesWatch.aspx). To expand on this bicycle metaphor, renewables do not yet comprise a majority share of most utilities’ electricity supply portfolios thereby requiring consumers to rely on conventional power (the equivalent of ‘cars’). As such, intermittent renewable production is integrated with, and offset by, the more consistent output of other conventional sources such as Hydro, Thermal (i.e. coal fired power plants and natural gas turbines) and other imports. 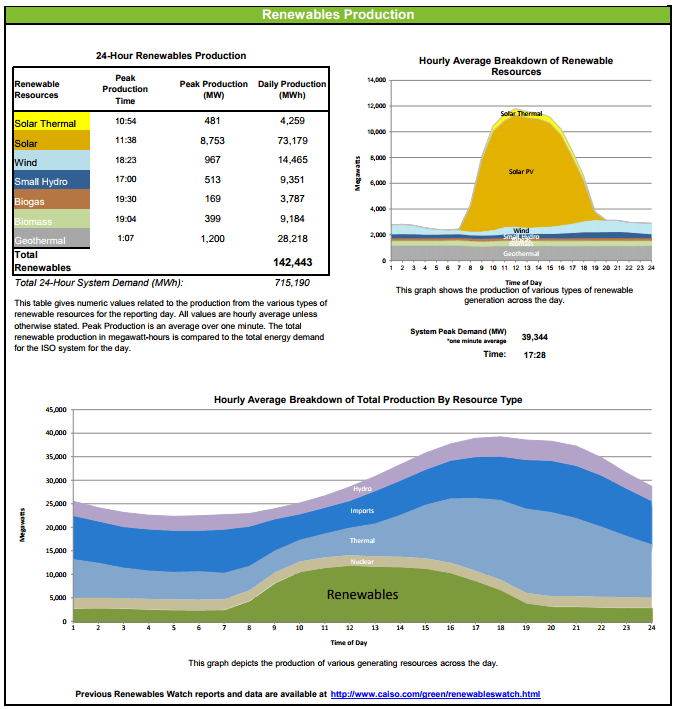 This integration can be seen within Figure 1 (bottom center) which depicts the hourly breakdown of total electricity production by resource type over the course of the same day within the CalISO balancing region. The composition of an energy supply portfolio (i.e. the proportion of our power that comes from natural gas turbines vs. solar panels vs. wind turbines, etc. ), is determined by the characteristic combination of cost, production capacity, and delivery response time associated with the individual energy generation technologies that are available relative to the electric power needs within a given service territory. Historically, electric power utility companies have been the sole agents responsible for procuring and operating the various energy generation technologies which make up these supply portfolios. As such, most utilities tend to procure generation technologies in a manner which seeks to minimize cost of operation and risk of supply interruption above all else. In recent years an increasingly large number of individuals and businesses throughout Southern California and the country have independently made the decision to deploy solar PV systems on their roofs and parking lots. This ad-hoc implementation has complicated utility efforts to manage what were previously considered to be their supply portfolios; when it comes to distributed renewables utilities are no longer able predict exactly when or where an individual will decide to add new supply capacity to the grid. The procurement and operation of energy supply systems – once solely the domain of utility companies – has been opened up in a process that constitutes perhaps the largest ever shift in agency within our energy system. This shift towards more renewable supply technologies reflects not only their declining cost but also the relative increase in the perceived value which renewables are able to provide in terms of mitigating damages to our environment and, in particular, our climate system. In his 2004 book “The Last Hours of Ancient Sunlight,” author Thom Hartmann popularized the concept that fossil fuels can be thought of as the chemical embodiment of solar energy that was incident to the earth’s surface millions of years ago. Using his reasoning, we can redefine fossil fuels as little more than “just another energy storage option.” When the issue of energy storage is raised, particularly in the context of the intermittent behavior of renewable supply sources, the implicit assumption however is that we are trying to capture and redistribute solar energy that only very recently arrived on this planet. This is a subtle distinction is important. The current solution to the problem posed by intermittent renewable production has two components: (1) limit the fraction of renewables within the energy supply portfolio so that it does not constitute the dominant source and (2) offset the difference between renewable production and total demand by ramping up production from other, low latency supply technologies (i.e. hydro and natural gas). Hydro and natural gas can be understood in terms of stored solar energy. With hydro, energy is stored in a potential kinetic form. For example, a mass of water stored at a high elevation is like a boulder sitting at the top of a hill. At rest it is inert, but when pushed over the edge of the hill its potential energy is released by its movement under the force of gravity. Hydro facilities are large engineered systems that convert this type of kinetic energy into electricity through the mechanical operation of a turbine. The key insight here is that water inside of a reservoir has been physically transported to that high elevation location by the wind driven movement of atmospheric water vapor that we call the hydrologic cycle. If we then recognize that wind is caused by the differential heating of the earth’s surface by the sun, we can ultimately conclude that the potential energy embodied in a hydro reservoir as stored solar energy that was incident to the earth with a time delay on the order of months or years (i.e. the time it took to make the wind, which blew the clouds, which made the rain, that drained into the reservoir). When thinking about natural gas a form of energy storage, the situation is a bit different. Rather than the sun’s energy being stored in the form of a kinetic potential, it instead is stored in the form of the chemical bonds contained within hydrocarbon gas molecules. Natural gas is a physical substance which is generated from the anaerobic decomposition of biological material that was trapped within the earth’s crust and pressurized over a time span of millions of years. As such, it can more directly be compared to other forms of energy storage that are commonly referenced in the discussion of intermittent renewable adoption. Figure 2 depicts two energy systems with differing fractions of intermittent renewable energy supply. The first system, on the left, has a comparatively small fraction of intermittent renewables (i.e. solar). The variability in the renewables’ production is offset by higher levels of production from thermal sources (i.e. natural gas). This hypothetical system has been contrived to reflect the key characteristics of our current energy system here in Southern California. Now, compare this scenario to the system depicted on the right. In it, the level of thermal production capacity has been reduced and offset by increased solar capacity. This shift in the composition of the supply portfolio results in situation whereby during the afternoon, when solar production is at its peak, energy supply exceeds demand. Alternatively, during the early morning and evening hours, the lack of solar production results in a situation where demand exceeds supply. These excesses and deficiencies are shown as green and red colored areas in the plot, respectively. The curly arrows connecting the green areas to the red areas in the right portion of figure depict the transfer of current excess energy supply to periods of future excess demand. The need to facilitate this transfer is the hidden cost of energy systems that are based upon intermittent forms of renewable energy supply. Ideally, this transfer will be facilitated by low carbon energy storage media. Regardless of how it is accomplished however, careful consideration of this process is of paramount importance before additional intermittent renewable capacity is phased into the system. The reason why the rapidly falling cost of solar might be interpreted as a “potential problem” is that the cost of energy storage, though also in decline, is not yet falling at quite the same rate. To illustrate this fact, consider the information contained in Figure 3, which plots the decline in the cost of battery energy storage technologies between the years 2005 and 2014 as measured in units of 2014 US dollars per kWh of energy stored. This shape of this “learning curve” is characteristic to many types of advanced technologies and reflects the efficiencies of scale which can be gained as manufacturing evolves from an initial low volume phase to one of high penetration mass market saturation. Over a period of just ten years the average cost of battery storage systems among all market participants declined by more than a factor of 3. This is a tremendous improvement albeit one that is diminished by comparison to the truly astounding relative decline in the cost of solar PV modules. While the energy storage sector is not yet experiencing the same rate of cost decreases as the PV sector, the near term prospects for cost reductions, particularly for battery technologies, appear to be incredibly strong. In other words: although the coast of solar is going down faster than the cost of storage, there is hope. And indeed, much of this optimism can be attributed to the recent parallel growth in the popularity of and demand for plug-in battery electric vehicles as typified by the Tesla Models S & X, the Chevy Volt & Bolt, and the Nissan Leaf among others. 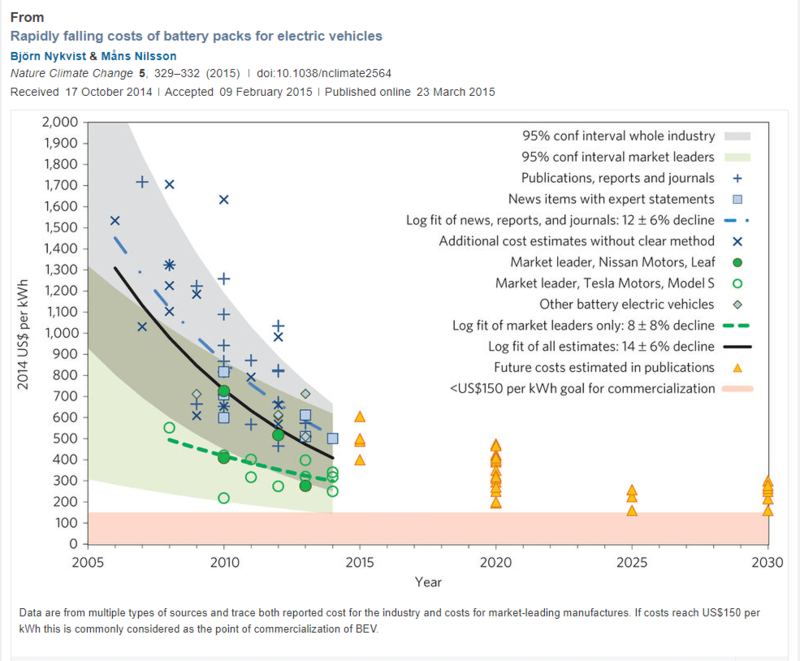 The reason for this is that in order for these vehicle manufacturers to achieve cost parity with similarly performing combustion engine powered vehicles they will continue to require significant price declines in the underlying battery storage systems (electric vehicles’ #1 component cost). As a result, many of these manufacturers are currently investing heavily in both the development of new battery chemistries as well as in the scale and refinement of their existing battery manufacturing capabilities. In conclusion it is important to remember that although the focus of our discussion here has been on the cost improvements of battery technologies, they are by no means the only (or even best) energy storage option available. That decision of which storage technology to adopt depends heavily upon the details of your individual power requirements. If you are interested in learning more about this aspect of the energy storage issue stay tuned for my next post which will review the differences in function and performance of the various other energy storage options that are out there and attempt to develop some understanding how they might be used together to develop a more balanced, more diversified, low carbon energy system. Featured Image sourced at Unsplash.